How do the world's most advanced economies compare when it comes to providing paid leave for new parents? Which country provides the most paid leave? Which provides the least? Danish parents receive 100% of their previous income for one year after the birth of their child. In the Czech Republic, new mothers can take 28 weeks of leave at 70% pay, with an additional 3 years of leave available to either parent. In that stressful period right after birth, Dutch parents receive seven full days of care with a "maternity assistant." In the United States, there is no federal support for paid family leave for mothers and fathers. The U.S. is the only rich nation in the world with no federally-guaranteed paid leave. In Italy, employers must provide leave to expecting mothers for two months before and three months after the birth of their child. In Sweden, close to 90% of all fathers take paid paternity leave. In Slovakia, expecting mothers are required to take six to eight weeks of paid leave before the birth of their child. Parents receive a "baby bonus" upon the birth of their child to cover hospital costs. New mothers in Germany are required to take at least eight weeks of paid maternity leave. In Norway, 14 weeks of paid parental leave is reserved just for the father - and most of them use it. In the United Kingdom, new parents receive about 90% of their previous salaries during 9+ months of paid family leave. In 2013, paternal leave in Poland was more than doubled, giving new parents up to a year of paid time with their children. In Slovenia, fathers receive about the same about of time off and pay as mothers do during maternity leave. Swiss mothers and fathers earn about 80% of their previous incomes during 3+ months of paid family leave. In Greece, expecting mothers can start their paid maternity leave up to eight weeks before the due date. In Hungary, mothers can take maternity leave with some form of benefits for up to three years. In France, new parents can take 44 weeks of leave, but they receive only about 58% of their previous income. Mothers in Israel have been entitled to paid maternity leave since the 1950s. In Portugal, new fathers are required to take 10 days of paid leave following the birth of their child. Australia's family leave policy only provides about 44% of one's previous compensation during the nine months of leave. In Spain, all new mothers must take at least six weeks of paid maternity leave following the birth of their child. In Lithuania, fathers receive the same amount of time and pay as mothers for parental leave. New Zealand extended their paid parental leave by four weeks in 2014. Romanian parents earn nearly 80% of their income during their 16+ months of paid family leave. In Ireland, mothers on maternity leave keep earning vacation pay at their jobs. In Finland, mothers and fathers receive about 70% of their previous income for one year. After the first 15 weeks of paid maternity leave, mothers can take eight months of part-time leave. The total rate is about 57% for the nearly 8 months of leave. 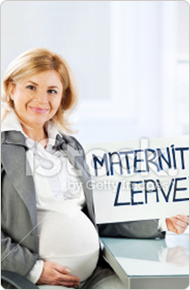 Every employed woman in Austria receives at least 16 weeks of maternity leave at full pay. The total rate for the 15 months of paid leave is about 85%. Want to do the Family Leave Activity? View this page on your desktop. There’s nothing like the first day you bring your baby home. The coos, the cries, that sweet smell from the top of her head…and tick-tock goes the clock. From birth the clock starts ticking away the precious little time we allow parents and their babies to bond before returning to work. How is it that in the wealthiest nation on earth we ask so many parents to make a trade-off: you can take time to recover from childbirth, bond with and nurture your new baby, but you’ll have to forfeit your pay? That’s a trade many can’t afford. 40% of new mothers return to work within three months of giving birth. Some because they have to; most because they want to. All rich and middle income countries guarantee new mothers paid leave and 25 now provide paternity leave too – with one glaring exception: the United States. The Family Medical Leave Act (FMLA), passed in 1993, offers 12 weeks of unpaid leave to care for newborn children or other sick family members. But there’s even a catch to that: workers must be employed by a company with 50 or more employees for a year, working an average of 24 hours per week or more. As a result, more than 2 out of every 5 employees have no federal legal right to return to their job if they take unpaid leave—of any length—to care for a newborn. In other words, they can be fired (unless their state provides additional protections). And every year, more than 2.5 million employees who are eligible for FMLA don’t take the leave because they can’t afford the loss of pay. There are companies which understand the benefits and provide paid leave for their employees, but the number is small. According to the Bureau of Labor Statistics, only 13% of private sector workers were allowed some paid family leave in 2014--mostly higher-paid professionals, managers and executives. But some states have begun to guarantee some paid parental or family leave including California, New Jersey and Rhode Island (four to six weeks at 40% to 55% of one’s wage, depending on the state). A growing movement is compelling some cities and even the federal government to offer their employees paid leave. Still, the U.S. is an outlier, lagging far behind comparable nations. Paid leave is the rule, not the exception, in every other rich and middle income nation. Working mothers are guaranteed paid leave, commonly financed through a form social insurance (like social security). In many countries paid leave is interchangeable with fathers (or partners), and some countries reserve a portion of paid leave just for fathers. If they don’t take it, the family loses the time. That’s not only boosted the number of fathers taking leave, but studies show that mothers and fathers more equally shared child care and housework. Ranking countries based on their family leave policies is a challenging business, given all the variations in their maternity, paternity and family leave programs. Some countries offer more weeks of paid leave but at a partial percentage, some offer fewer weeks of paid leave but provide 100% of one's previous income, some base the percentage on the median national income and some provide a flat rate. For this comparison, we chose to rank countries based on the total number of weeks of paid leave offered during which they provided at least 50% of one's previous income. In a practical sense, this seems like the minimum amount of pay that a family would need to consider actually taking paid leave. Any less than 50% and it may not be possible for a family to afford taking the leave to care for their child rather than working and paying for childcare. Of the 30 economically-developed nations in this list, only three provide less than 50% compensation (Slovakia, 35%; Australia, 44%; USA, 0%). More than two-thirds of the nations provide more than 70% compensation during paid leave. The goal of this interactive was to compare the United States to other large, economically-developed nations in the world. How does the United States's family leave policy compare to the programs found in economically similar countries? The trick is to figure out which nations are economically similar. The OECD's list is different from UNICEF's list which is different from the ILO's list. For the purposes of this comparision, we chose to use the International Labour Organization's (ILO) list of "Developed Economies." The International Labour Organization has produced the most recent, comprehensive international comparison of family leave policies that included most nations in the world (the ILO's 2014 report, "Maternity and paternity at work"). In this report they categorize 37 "Developed Economies"--this is where we started our list. Of these 37 countries, a number of them are extremely small nations (e.g., Cyprus, Luxembourg, Malta, San Marino) which are not useful for this comparison. Removing these small nations reduced the list to 32 nations. In order to reduce the list to a manageable 30 countries, we also dropped the next two smallest countries, Latvia and Estonia, from the rankings. The U.S. is the sole rich or middle-income nation not to guarantee paid maternity or family leave by law. Without paid leave, 40% of new mothers return to work by the time their babies are three months old—some because they want to, most because they have to.